Updated 8 p.m. EDT: The jury began deliberating on Wednesday in the trial against the man accused of killing three members of Academy Award-winning Jennifer Hudson's family in a bloody rampage at their home in Englewood on Chicago's South Side. Cook County Judge Charles Burns sent the case to the 12-person jury after four hours of tense closing arguments, during which the actress broke down in tears and lowered her head when prosecutors displayed images of her dead family members. She kept her head lowered during much of Cook County prosecutor Jennifer Bagby's chilling closing argument. Her sister, Julia, who was married to Balfour, kept her head lowered and dabbed tears away from her eyes. In the end, prosecutors argued that there was enough circumstantial and physical evidence to convict the actress's ex-brother-in-law, William Balfour. Defense attorneys, however, raised question about whether prosecutors were trying to build a case or solve a case, saying they wanted to pin the murders on him before there was a complete investigation. Bagby began the state's arguments by listing the names of the victims and displaying images of their dead bodies. "They were given new names: 379 October, 378 October and 414 October," she said. "These were the numbers assigned to their dead bodies. The man who gave them their new names sits across the courtroom. It's time to hold him responsible." The sisters continued to cry, and the jury paid rapt attention as Bagby listed the charges: first-degree murder, home invasion, residential burglary and possession of a stolen vehicle. Balfour pleaded not guilty to the charges, and his defense team has argued that there is no forensic evidence linking him to the killings. The defense's closing focused on dismantling the prosecutor's evidence. Attorney Amy Thompson stormed the podium, her voice raised, telling the jury that the state has told them nothing but stories. "They know as they sit here that they have failed to prove their case," Thompson said. "He is on trial for his life." She said that police investigators focused on Balfour because he was an easy target in a high-profile case. She said that witness testimony has proved that there is no DNA evidence on the murder weapon or in the SUV that links Balfour to the crimes. She called into question police work in the case, saying that Jason Hudson's keys suddenly appeared on an evidence list about a month after the killings. Assistant State's Attorney James McKay, through clenched teeth, rebutted the defense's argument, telling jurors that there was a "tsunami of circumstantial evidence" against Balfour. McKay began by saying, "Calling him a dog is an insult to dogs." The dog comment was a reference to a mention by defense attorney Thompson, who called Balfour a dog in an effort to defuse the fact he was cheating on Julia Hudson with multiple women. Addressing the lack of DNA evidence against him, McKay told jurors that it means "Do Not Acquit." Updated 1:50 p.m. EDT: Closing arguments began with prosecutors painting a horrifying portrait of the day of the murders on Oct. 24, 2009, complete with images of the dead bodies. The racially mixed jury paid close attention to the prosecutors, while several of them furiously scribbled notes. Jennifer Hudson, flanked by her fiancé and her sister, Julia, lowered her head and wept. She was dressed in a modest two-piece ensemble with a dark dress and two-tone beige-and-green gauzy jacket. Julia was dressed in a fluorescent green, short-sleeved dress. She lowered her head and dabbed her tears with a tissue. During the hourlong closing, prosecutors worked hard to tie William Balfour to the murders in a case that is mostly based on circumstantial evidence. "There is physical evidence in this case," said Jennifer Bagby, an assistant state attorney. "In this case, the absence of physical evidence, fingerprints, DNA, does not mean the evidence of absence." She pointed to witness testimony, tracking of his cellphone and his actions, including turning off his phone. Earlier, Balfour's mother, Michelle, was tearful as she awaited entrance into the courtroom that morning. She was surrounded by supporters. Closing arguments are set to begin today in the high-profile murder trial of William Balfour, who has been accused of killing three members of Academy Award-winning actress Jennifer Hudson's family. Testimony came to an abrupt halt on Tuesday after prosecutors rested their case and after only two witnesses — both police officers — took the stand for the defense. Balfour, the actress's ex-brother-in-law, did not testify on his own behalf, and criminal-trial experts say that was probably a good move, according to the Chicago Tribune. The goal of the defense is to keep jurors focused on the strength or weakness of the state's evidence, not whether or not they like a defendant, which is a risk if he testifies, an expert told the Tribune. Balfour is accused of going on a murderous rampage after her sister, Julia, refused his advances to reunite their marriage. He thought she was seeing another man. In a case, however, that defense attorneys say rests mostly on circumstantial evidence, prosecutors presented 84 witnesses in a little over two weeks. 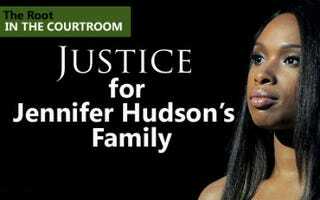 Jennifer Hudson, who has sat in the courtroom from Day 1, was the first witness to testify at the trial for the killings that took place in October 2008. She said that no one in the family liked Balfour and he treated her sister poorly. Since then Jennifer Hudson has appeared in court daily, sitting between her fiancé and her sister. It was her sister, Julia Hudson, who discovered the bodies of their mother, Darnell Donerson, 57, and their brother, Jason, 29, in their sprawling nine-bedroom home in Englewood on Chicago's South Side. The body of Julian King, 7, was found later in Jason Hudson's missing white Chevrolet Suburban. One of the last witnesses for the prosecution testified that a key found in Balfour's pocket when he was arrested fit the Suburban. But the defense has worked hard to tie the gangland-style hit to the bustling cocaine business that Jason ran out of his home. Beyond that, several forensic analysts testified that Balfour's DNA and fingerprints do not appear on the alleged murder weapon, in the SUV or in the Hudson home. A legal expert told The Root that it would be hard to convict a defendant without scientific evidence. But soon it will be up to the 12 members of the diverse jury to decide the fate of William Balfour. Lynette Holloway is the midwest bureau chief for The Root. The Chicago-based writer is a former New York Times reporter and associate editor for Ebony magazine. Read prior courtroom updates from Lynette Holloway here.